He did not know that it marked the last act of his life on this earth…and the beginning of a terrifying journey into a strange new world where the twentieth century was already ancient history. Oh, but this is a silly book. A silly, silly book. 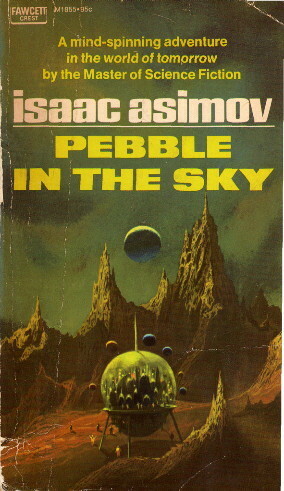 Pebble in the Sky is Asimov’s first official book and first novel, and it’s one of my favorites. It is certainly the best of the three Empire novels. It’s an expansion of an unsuccessful novella, “Grow Old Along With Me,” which is included in The Alternate Asimovs. It must be admitted that the novel is an improvement on the novella, as Asimov himself notes. There’s happens to be a strange, unprecedented, nuclear accident. It happens to transport our first protagonist, Joseph Schwartz, to the distant future, but nothing accompanies him other than part of a Raggedy Ann doll, and so he is completely cut off from the familiar. The Earth of the future is a patchwork of normal soil and land so contaminated with radiation that it glows, and life on Earth is so marginal that it is highly regulated by the semi-religious and tyrannical Brotherhood. One of the strictest of their Customs is the Sixty, euthanization of everyone by age sixty with a very small number of exceptions. Schwartz happens to be sixty-two. Earth, moreover, is a backwater in the Galactic Empire of the Foundation universe whose inhabitants happen to be much hated by the rest of the Galaxy. This hatred is more than mutual. Physicist Affret Shekt happens to be working on a machine to improve human learning ability, the Synapsifier, in the nearest city, Chica (née Chicago). Grew happens to see a notice in the paper calling for experimental volunteers and Schwartz is volunteered in the hopes that he can learn to speak. Shekt happens to be willing to treat Schwartz despite his strict orders not to treat anyone not sent by the Brotherhood, and despite the wildly suspicious behavior of the farmer who brings him in. Shekt also happens to have a beautiful and unattached daughter, Pola. The treatment happens to give Schwartz not only the ability to learn the current language quickly, but also mysterious mental powers allowing him to read other minds and, to a limited extent, control them. This appears to be the result of his being a slightly different, less evolved human being. Our final protagonist, the iconoclastic archaeologist Bel Arvardan, happens to be in Chica when Schwartz tries to escape from the Institute where he has been treated. He happens to stumble into the nurse looking for Schwartz, who happens to be Pola Shekt. He happens to be instantly smitten with her and she with him. Arvardan happens to be with Pola when she finds Schwartz. When they are caught in a dragnet after a false Radiation Fever scare (called in by the Brotherhood’s agent who happens to have noticed Schwartz acting suspiciously earlier), they happen to encounter a particularly bigoted Imperial officer, Lt. Marc Claudy, who provokes Arvardan and gets his arm broken as repayment. Later on, Schwartz happens to kill the Brotherhood’s agent as he tries to return to Chica on his own. Despite this, Schwartz happens to get himself captured almost the instant he’s back in town. Even though it’s not his field, Arvardan happens to have heard of the Synapsifier and happens to want to meet its inventor. He happens to be back in Chica doing so when Schwartz is captured. Shekt relates how he happens to have discovered what the Brotherhood wanted the Synapsifier for: biologists have been treated and used their increased learning ability to develop a deadly strain of Radiation Fever, and the Brotherhood is about to use it to decimate the Galaxy. Both Shekts and Arvardan happen to be captured by the Brotherhood and held with Schwartz. Schwartz happens to be able to convince Arvardan that he’s a time traveler, and Arvardan happens to convince Schwartz to join him and the Shekts in fighting the Brotherhood. Balkis, Secretary to the Brotherhood’s High Minister and the mastermind behind its fiendish plot, happens to want to gloat over them with no guard in the room. Schwartz happens to be strong enough to use him as a cover as they make their escape. This escape happens to be right before the Brotherhood is scheduled to launch its attack. When they reach the local Imperial fort, they happen to run into Lt. Claudy, who happens to be the officer of the day. Claudy happens to slow down their efforts to contact Lord Ennius, the Imperial Procurator for the Earth, whom Arvardan happens to know. Ennius himself happens to prevaricate long enough that the Brotherhood seems to have succeeded in its plans. Schwartz, however, has taken advantage of Claudy’s anti-Earth prejudices. Claudy happens to hate Earthmen so much that only a small nudge is needed to get him to go out on an unauthorized bombing run and destroy a major Brotherhood temple. The description of the temple’s location happens to be not quite so vague that Schwartz can’t figure out that it’s what used to be St. Louis. Nobody happens to hear about the bombing until after Balkis has confessed the plot and gloated at its success. And, of course, at the end, Arvardan happens to love Pola enough that he’ll marry her despite her utter unacceptability in his social circles, and the Empire happens to be grateful enough that they’ll start shipping fresh soil to Earth in an attempt to let it rebuild. That’s a lot of “happen”s in one plot summary. At one point, Balkis insists that Schwartz, Arvardan, and the Shekts are all part of an Imperial spy ring for the simple reason that attributing their movements to sheer random chance is unbelievable-and he’s right. Coincidence is piled on coincidence to such an extent that Charles Dickens would blush. Now, as a rule, Asimov eschewed wild coincidences to move his plots. Usually when there is a string of unlikely events, it turns out that someone is manipulating things behind the scene (“The Mule”, The End of Eternity, Foundation’s Edge). This doesn’t mean that a coincidence-driven plot is a bad one-again, look at Dickens-but unless the author manages to keep the patter interesting enough, the audience will notice when he sneaks the rabbit into his hat. Asimov here keeps the patter interesting. For one thing, he skillfully juggles the two main plots (Schwartz’s and Arvardan’s) until they meet, shifting back and forth to keep our attention moving. For another, even though events unfold slowly at points for the characters, he glosses such stretches over in a few pages, so that the action does not let up. For the background, Asimov has largely followed the approach he used with the early Foundation stories and done a The Foundation of SF Success. Plagiarizing from Roman history helps simplify setting up the basic conflict: tradition-bound Jews (Earthmen) resenting their Roman overlords (the Galactic Empire), who hate them in return. Rebellion is always a very real possibility. We even get to see our Procurator solemnly proclaim that he finds no fault in a man brought before him for judgment. Asimov’s overall humanism guarantees that good guys and bad guys are on both sides of the Earth/Empire divide. It is, nonetheless interesting (or perhaps telling?) that the plot to destroy the Galaxy is hatched by the Jewish stand-ins, the Earthmen. One could hardly accuse Asimov of antisemitism, of course-and goodness knows Schwartz is as Jewish as Preem Palver even if Asimov doesn’t bother to say so. Asimov’s disdain is more directed at hoary traditions and demagogues who capitalize on religious feeling. I don’t know if Asimov ever read Josephus or Philo, but he certainly knew his Gospels, and his portrayal of Earthmen is colored by New Testament views of contemporary Judaism. The Evangelists are hadrly complimentary when talking about Jews and Jewish factions, and this plays nicely into Asimov’s overall perspective-very strong in the 1940s: although people are basically good, religion tends to undermine that goodness. As for the characters, they all pretty much come straight from Central Casting: the world-weary politician, the bewildered fish-out-of-water (who, being a Jewish taylor, is a twofer), the overgrown Boy Scout, the nasty bigot, the duplicitous villain. We even have the scientist’s beautiful daughter, for goodness sake-and yet, although all the characters are drawn with a few broad strokes, the most important ones get enough small details sketched in to give them life. Take Arvardan for instance. He’s young, handsome, well-connected, frightfully intelligent, brave, gallant, indomitable, and rash. He leaps to the help of others, even if he hasn’t done much looking first. He even has the good sense to fall in love with the heroine almost at the drop of a hat and to get her swooning over him just as quickly. What a guy! At the same time, he’s a creature of his own time and place-and he knows it. At first, he’s the perfect model of the liberal humanitarian. He’s willing to give Earthmen jobs with his expedition-provided nobody else objects strongly and they don’t smell too bad. When Earthmen treat him with disdain, he thoughtlessly returns it. He even feels guilty about falling in love with an Earthwoman. However, when the chips are down and Schwartz confronts him, he candidly confesses that he doesn’t live up to his own ideals. Above all, Arvardan is portrayed as passionate-about his own theories, about archaeology, about Pola, and above all about humanity. His passion is catching. Schwartz, the other protagonist, presents another interesting aspect of the novel. Pervading the whole is the fear of death-specifically the fear of death through uselessness-and the fear of aging which itself makes one useless. Schwartz, for one thing, finds himself in a situation where he is genuinely incapable at first of any productive work, and even when he learns to be a farmer, he finds he can’t expect to fulfill any other role. He can’t even talk at first and retreats into complete passivity. Unusually, too, no fewer than three of the book’s major characters are confronted with age, uselessness, and death: Schwartz is sixty-two and would be euthanized at once if this gets out, Grew is in his late fifties but overdue for the Sixty because of his disabilities, and Shekt is close enough to the Sixty that he’s willing cooperate with the Brotherhood against his own moral judgment in the hope that they will let him prolong his life. Even where age is not an issue, we have the fear of uselessness-Ennius frets about his impotence as the symbol of Imperial power on this hayseed world. It’s remarkable that Asimov should have hit on this theme with his first novel. His parents were in their early fifties when he started it and wouldn’t even start slowing down for years. He himself was in his late twenties and not even a father. Nor would he ever return to the aging as a theme for a long, long time. There is an occasional flirtation (such as in the final section of The Gods Themselves), but nothing more. Aging isn’t a matter that seems to have seriously occupied Asimov’s attention, and by the time he was himself in his fifties and sixties, he was rejuvenated by his own relentless pace, by his fame and success, and above all by his marriage to the love of his life. It wasn’t until he hit seventy and became severely and chronically ill that his natural enthusiasm for life began to fade and he started to feel old. Many of his last books have a bittersweet awareness that, although his life was a good one, it was not to last much longer. Works such as Asimov Laughs Again, I. Asimov, and Forward the Foundation include meditations on aging and dying-but the faintest echoes of those meditations are curiously to be seen on the first pages of his first novel where one would least expect them. Asimov himself was a little embarrassed at his treatment of age in Pebble in the Sky. Personally, I think his handling of romance in Pebble is a little more groan-inducing, and despite the off-the-mark view of middle age espoused by Schwartz at the beginning of the novel, it is the rest of the book that counts, and the rest of the book belies itself the idea that growing old is a long, slow decline into quiet obsolescence, let alone that life ends at sixty. 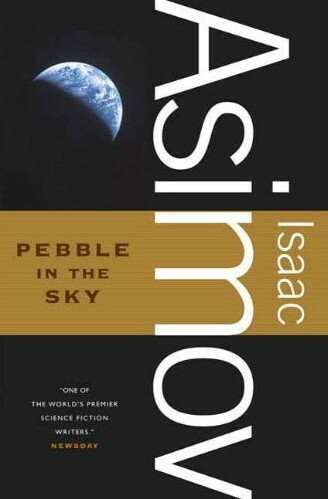 Pebble in the Sky may suffer from a surfeit of “fridge logic”-plot points that seem OK when you’re reading but which don’t make an awful lot of sense when you think about them afterwards (specifically, when you’re at the fridge and getting a snack)-but this is actually the novel’s greatest strength. Yes, the plot really stretches credulity once you sit down and think about it, and yes, the characters are pretty much people we’ve all seen repeatedly before and will see over and over again. We are, however, in the hands of a top writer near the peak of his abilities, and so the book is nonetheless hugely entertaining . You’re so swept up in the story as you read it that you don’t notice (or don’t care about) its flaws. Pebble in the Sky lacks the conceptual brilliance of the Foundation stories, the logical complexity of The End of Eternity, and the emotional weight of “The Ugly Little Boy,” but this book is very simply fun to read. As Alexandre Dumas père or J.K. Rowling can attest, being the author of a fun-to-read book is nothing to be ashamed of. Goodness knows I get a goofy, delighted grin on my face every time I reread it. Copyright © 1995-2011 by John H. Jenkins. All rights reserved.